I’m cross-posting this from the Serif Affinity Design Bugs forum as I’m not entirely sure where the problem is. I keep running into a strange (and annoying) problem when copy/pasting objects from Affinity Designer to Glyphs in that some geometry is lost in translation from Designer to Glyphs (see attached image, files.zip (16.9 KB) also provided). 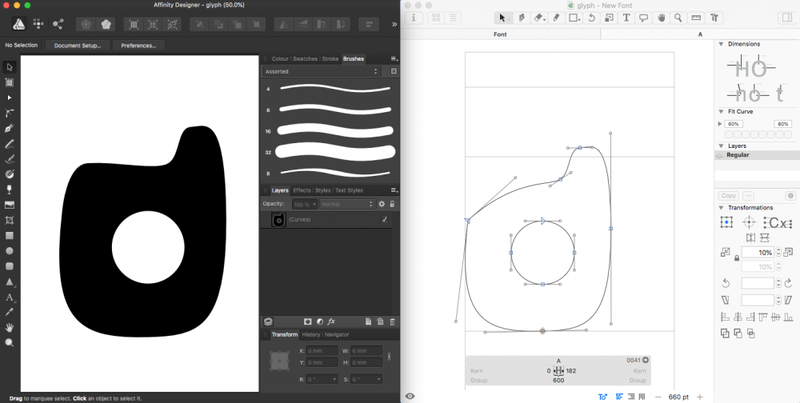 If I export to SVG and then import into Glyphs everything is fine (but this makes the process much more laborious), as is also the case when I convert the origin node to a smooth curve, etc. If I simply leave the origin node as is it appears that the node immediately after the origin node is omitted on copy/paste. I’m not sure if this is a Designer issue or Glyphs issue, but thought I’d cross-post it here just in-case anyone else runs into the same issue. I have fixed it. It only happens if there is a “dead” curve (if there is one zero length handle).